at the corner of Ave. 50 and York Blvd. Classes are $25. Come half hour early if you don't know how to crochet. You will make at least two hyperbolic origami figures. We are closed. We are no longer open. so there is room for you! Ever wanted to learn to sew? 323 254 4652 or jfureno@worldnet.att.net. or you can come to hers. are still and will continue to be available. contact Maggie about sewing or jams. Email us to contact us. Please. Contact us if you'd like to join us. We can still offer classes. is how you can still reach us. The old phone number no longer works. with Join on the subject line. we do ship our yarns, needles, hooks, and books! we'll still ship our wonderful goodies to you. with 'Join' on the subject line. Newsletters go out every 3 months. Recession, or everything is fine? Yarn - sheep's wool or alpaca? Climate - change or warming? Shopping - local or big box? Burrito - veggie or carnitas? Felting - cool, or chaotic? Bush - saint or sinner? but now, those groups meet no longer. 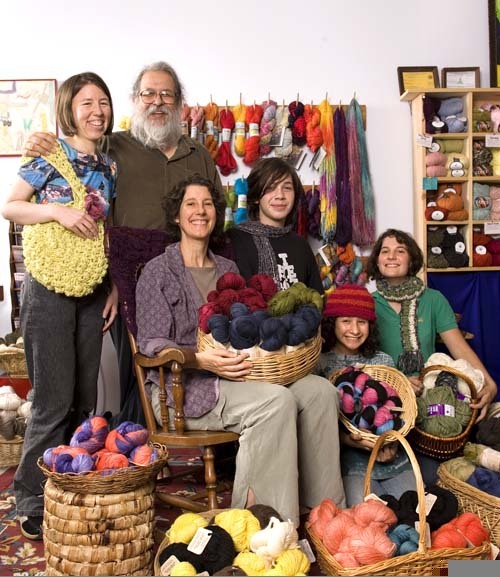 What would you like to see in a yarn store? tell me you read this, and you'll get a That Yarn Store pen! Still available, but much harder to obtain.